Wine from local vineyards, stuffed mushroom caps, watermelon filled with salty feta cheese, breads and extra virgin olive oil to start a steady stream of good country music by local faves Amanda Gray and Chris Lockhart from Yuba City set the tone above the low hum of big industrial swamp fan coolers working away to keep the crowd cooled under the big shady trees to manage the 110-degree heat in support of local farmers and ranchers. Yep, July 22 the thermometer in Colusa reached a scorching 110 – just in time for the 2nd annual Farm to Fork Dinner held at Veteran’s Memorial Park. The Dinner was a near sold out affair anyway and lots of folks came out, I would guesstimate upwards of 150 or so, to celebrate local farming and support the community. A special congratulation to Jennifer Diaz for doing such an amazing job making this event happen. As she commented to me recently, ” Lots of work, Lots of fun”. That genuine spirit was certainly evident to all attendees. And, no kidding, after an hour or so I was comfortable enough to forget how hot it was! 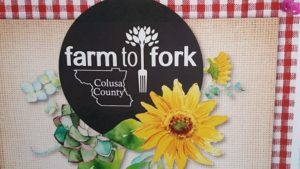 The Colusa Certified Farmer’s Market committee along with the Colusa County Chamber of Commerce organized the event with help from a Grant from Premier Mushroom, a tenant at Colusa Industrial Properties, Northern California’s Premiere AgriTech Industrial Park. Rocos Bar and Grill, Colusa Casino and Market Street Grill served the locals. Main Street Grill was responsible for the outstanding Prime Rib and Vegetarian Lasagna entrees. And It was all locally sourced; Certified Angus Beef, vegetables, fruits, nuts, scratch made breads, wine, olive oils and locally grown plants everywhere. Great raffle prizes of foods, garden plants and supplies; table gift bags followed a yummy selection of desserts What a bounty! – I’ll be looking forward to next year’s Event…………please. Keep your eye on the new residential development at Colusa Industrial Properties, adjacent to the gold course. Those future residents, of the 180 home project, will be assured of a healthy, sustainable, Farm to Fork lifestyle as part of this generous farming and ranch community.